Note: As of November 7, 2018, RealtyShares is no longer accepting new investors. Check out our RealtyShares Alternatives here. Real estate crowdfunding is one of the fastest growing trends in the investment community. They provide obvious value to investors who would otherwise be priced out of commercial and private equity deals. RealtyShares is one of these crowdfunding platforms, but they have a unique niche. They work with both institutional investors and “the crowd” of smaller investors to find a wide range of projects. These can be anything from single family homes to commercial office buildings. While the range of products may boost your investment returns, they can get complicated in a hurry. When you choose to invest in RealtyShares, you need to know what you’re getting into. Net worth greater than $1 million (outside of your primary residence). First position liens- As an investor, you’ll almost always have a first position lien when you invest in single family or small multifamily residential properties. These are “Fix and Flip” loans with durations up to 24 months (in general, though some can run longer). If the borrower defaults on the loan, you’re first in line to get repaid. Preferred Equity- If you take on a preferred equity position, you do not have a foreclosure position, but you’ll have access to a “preferred” or higher interest rate and a faster payback period. These would be used to increase the amount of money and leverage available to an individual borrower (or project). You would commonly see this as a bridge loan for either a residential project or more commonly a commercial property. Mezzanine Debt (aka Bridge Loan)- Is almost the same as preferred equity, but you have a second position in foreclosure, and you can’t earn quite as much because you don’t share in the equity. JV (Joint Venture) Equity- You share in the equity of the project, but you don’t take any profits until the preferred equity rates are paid. Your expected investment horizon is 2-7 years. How Does Investing In RealtyShares Work? If you’re interested in investing in RealtyShares, you can simply go to the website, “self-accredit” and start browsing available projects. The projects that RealtyShares with their smaller investors may already be funded through either an existing line of credit, an institutional investor, or a partner equity fund. You must handpick the investments you want to fund (and you have to wait 30 days after signing up to fund them). Your minimum investment is $5000, and you’ll pay a 1% investment fee on equity investments, and up to a 2% interest rate spread on debt. As a special to College Investor readers, if you use the code PARTNER100, you can get a $100 bonus on your account when you make your first investment. Once a project reaches it’s funding goal (100%), your funds will be invested on your behalf. Depending on the project, you may expect quarterly payouts to start immediately, or at some point down the line. Your principal investment will only become available after the loan comes to term, or the investment is liquidated. Of course, that's all dependent on the investment performing as expected. There is always risk investing in real estate, and as an investor you need to understand that. Should You Invest In RealtyShares? Compared to other crowdfunding platforms, RealtyShares gives their investors a lot more control. You can choose the type of project, and the equity position that suits your risk profile. 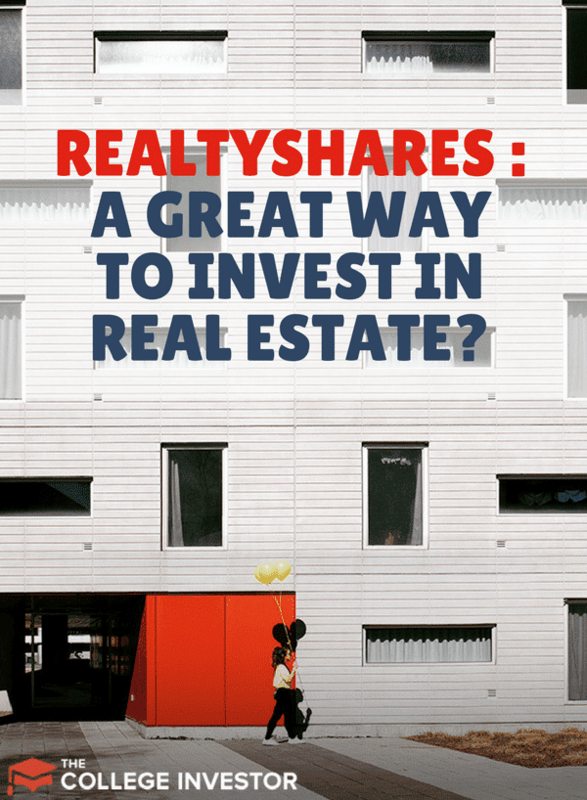 RealtyShares is an illiquid investment, so you should not invest money that you may need in the mid term. It’s most appropriate for investors who need exposure to real estate, but don’t wish to invest in publicly traded REITs or own property themselves. What do you think of real estate crowdfunding? Would you ever try RealtyShares? RealtyShares is a real estate crowdfunding investing platform for accredited investors. Large inventory, due diligence, and relatively low fees make it a good choice.